Here, we have part two of our look at da huang (a.k.a. 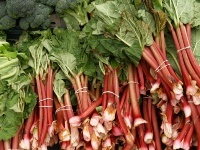 rhubarb), one of the pre-eminent herbal secrets in Chinese medicine. Here, we find out some of its amazing powers and the reasons for it—mostly, clearing heat and toxins away. Da huang was originally used to treat many illnesses caused by excess inflammation, such as gastroenteritis, gastric ulcers, duodenal ulcers, and cholecystitis (a sudden inflammation of the gallbladder). Not surprisingly, these all occur in the gastrointestinal system, which is where the herb does its best work. The ingredients within da huang fight inflammation, including “lindleyin.” This tannin may suppress inflammation as well as many popular painkillers do. Studies have shown that da huang also has pain-relieving effects similar to these drugs. In Chinese medicine, excess heat and toxins are prime sources of illness. Da huang fights both, used orally or externally—for the latter, it can be used to treat burns that are small or medium-size, and other minor skin irritations. Heat can also trigger sore throat, toothache, ulcers of the mouth, and reddening in the eyes. Da huang is great addition to a detox diet, especially against toxins built up in your intestines and colon. While purging toxins, it will also get blood moving again that was once stagnant. The most amazing ability of da huang is that it helps stop bleeding by triggering the body’s clotting mechanisms. It promotes healthy circulation, and unclogs stagnant areas. In your digestive tract, the herb helps keep intestinal blood vessels strong. It ranges from treating mild problems such as bleeding of the gums, all the way to helping one avoid serious problems such as stroke. Many studies suggest that da huang removes phlegm by pushing the digestive channels downward, helping relieve sluggishness caused by an acute stroke. Usually, when blood pressure is discussed, we’re talking about lowering it. But, for many who have hypotension, this is a big problem. We talk of this now on account of da huang’s ability to help reverse low pressure. Even better though, the herb could help lower cholesterol levels in people who have metabolic disorder, renal deficiency, or simply high cholesterol. Herbal extracts could suppress the creation of cholesterol by the liver, thus reducing levels.